If you’re looking for a camcorder that takes excellent videos, give Canon's Vixia HF M40 consideration, but look elsewhere if still photos are important. The first wave of 2011 camcorders has arrived and Canon took a page from its digicam playbook by *reducing* the megapixel count while ostensibly increasing quality. Yes, it’s counterintuitive to the perennial more-is-better theory but let’s see if it works for video as it did for stills. 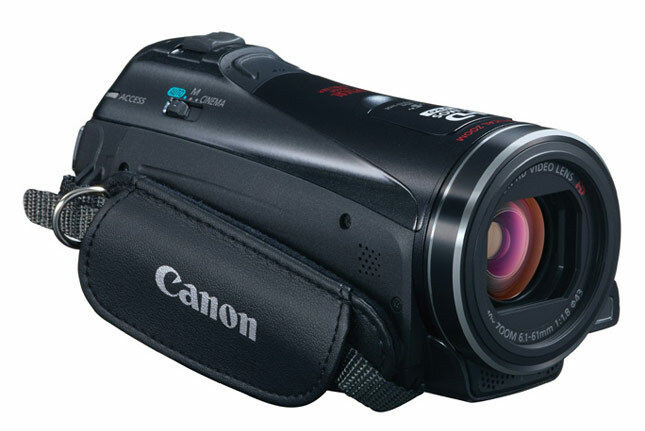 Canon’s Vixia HF M40 is a decided improvement over last year’s blockier-styled models. While it has a similar horizontal shape, swooping lines and two types of black-toned finishes take it beyond the basics. And while the exterior improvements are a plus, the truly significant changes are inside regarding the imaging sensor and related technologies. As DigitalTrends.com readers well know, camera manufacturers including Canon have taken a step back from the Megapixel Wars by introducing digicams with fewer but larger pixels such as favorites like the 10-megapixel PowerShot S95 and G12. Rather than cram as many pixels as possible on a small piece of silicon—which usually is a recipe for disaster and digital noise—less pixels is the new mantra for many models targeted to still enthusiasts—now it’s the camcorder buff’s turn. Where last year’s M series camcorders had ¼-inch 3.89-megapixel CMOS sensors, 2011 models have 1/3-inch 2.07MP HD CMOS Pro sensors. This chip is found in the three new M models and the top-of-the-line HF G10. At press events Canon stated the new imager has pixels 61% larger for improved color quality and better results in low light. As always we take these claims with a hefty grain of salt until we actually get one in our hands. 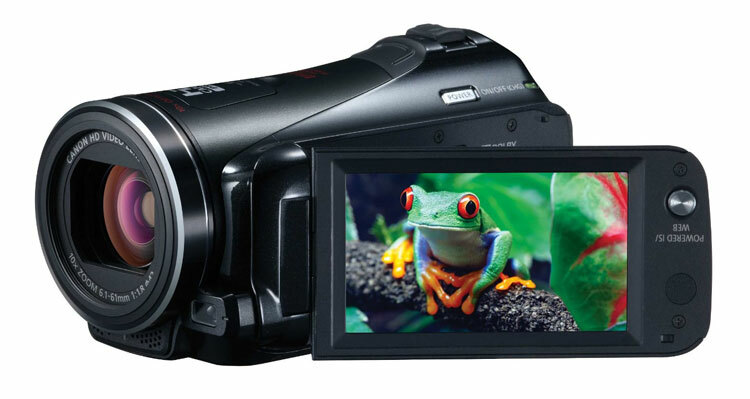 Beyond the CMOS sensor, the HF M40 has the features you’d expect in a $700 camcorder. Unlike the Flips of the world, it has a 10x optical zoom lens with a 35mm equivalent of 43.6-436mm, more than enough for typical use although we would prefer a wider angle of view like many new Sonys and Panasonics. Below the lens is a stereo mic as well as an Instant AF sensor. It measures 2.9 x 2.8 x 5.2 (WHD, in inches) and weighs 14.5 ounces with battery and card. Fortunately the exterior isn’t marred with too many controls and buttons other than power and mode switches while on the top is a zoom toggle and the cover for the hot shoe. Surprisingly there isn’t a dedicated photo snapshot button here—you have to tap the LCD screen to grab a shot. It’s not a deal breaker but different. On the right side is the comfy adjustable strap, a mode switch (Auto, Manual, Cinema), speaker, optional mic input and a compartment for two SDXC card slots, a real plus compared to the competition. Open the 3-inch widescreen LCD (rated a decent 230K pixels) you see the pluses of a touch panel as there are few hard controls. To the left of the screen is a button to adjust optical image stabilization and access white balance. On the body are four flat buttons to access Video Snap, Story Creator, Playback and Display/Battery Info. Video Snap and Story Creator are two options Canon gives shooters to enhance their videos. Video Snap records a series of short scenes while Story Creator give you hints as to what clips to take for a specific “story” such as Travel. We guess it’s helpful to some but hardly worth the effort. That’s it for the buttons though. USB, A/V, component and mini HDMI outputs are here as well. The rear has the record button, DC-in and battery slot. The supplied battery doesn’t fill the space so it looks a bit unfinished but you can always buy a bigger one to fill it in. The BP-808 battery that comes with the HM40 lasts for 75 minutes in typical start-stop use while the optional BP-819 is 150, making it a worthwhile investment if you pick up this camcorder. The HM40 comes with everything you need other than Class 6 or better cards: battery pack, AC power adapter, remote, stylus pen, USB, A/V and—hurray!–mini HDMI cables. You also get a 204-page Instruction Manual and the two software CD-ROMs contain Pixela Video Browser/Transfer Utility Disc and a photo applications/music disc. Using the 16GB of onboard flash memory as well as a SanDisk Extreme Pro 16GB SDHC card, it was time to capture some HD video and stills.